249 Commonwealth is located on the north side of Commonwealth, between Fairfield and Gloucester, with 247 Commonwealth to the east and 251 Commonwealth to the west. 249 Commonwealth was designed by architect Samuel D. Kelley and built in 1878-1879 by builder William Seavey Rand, for speculative sale. William Rand is shown as the owner on the original building permit application, dated November 1, 1878. The house was built on land owned by Henry Lefrelet Daggett, a leather and shoe merchant who lived at 116 Commonwealth. He had purchased the lot on March 15, 1866, from a real estate investment trust formed by John Templeman Coolidge, Franklin Evans, and Charles Henry Parker. The lot was part of one of several parcels the trust purchased from the Boston Water Power Company on January 29, 1866. The trust subsequently subdivided the parcels into lots, which it sold to investors and builders, who then frequently resold the lots to others. Click here for an index to the deeds for 249 Commonwealth. On June 20, 1879, after the house was completed, Henry Daggett sold the land to William Rand, who then sold the land and house to real estate dealer Henry Whitwell. 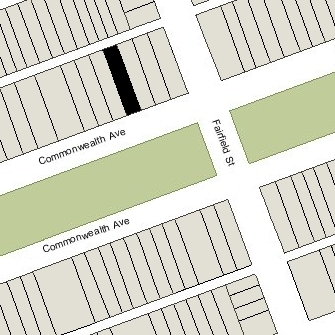 In 1878-1880, Henry Daggett and William Rand engaged in a similar transaction to develop the vacant lot at 114 Commonwealth owned by Henry Daggett next to his home. William Rand built the house, also designed by Samuel D. Kelley, purchased the land from Henry Daggett when it was completed, and resold it on the same day. On November 28, 1879, 249 Commonwealth was purchased from Henry Whitwell by Susan Cordelia (Delano) Cotting, the wife of real estate investor Charles Uriah Cotting. They previously had lived in Brookline. Susan Cotting died in June of 1896. In her will, she left the bulk of her property, including 249 Commonwealth, in trust for the benefit of her husband during his lifetime. After his death, she specified that $100,000 was to be distributed to a trust for the benefit of their son, Francis Joy Cotting, and the remainder distributed equally to their other four children. Charles Cotting continued to live at 249 Commonwealth. Their two unmarried children, Francis Cotting and Alice Cotting, lived with him. Francis Joy Cotting was a founder and president of the Industrial School for Crippled and Deformed Children. In his obituary, the Boston Globe noted that “crippled himself, and understanding better than anybody else the odds against which a cripple who must earn his own living has to contend, he was interested in the school…from its inception..” and was largely responsible for its growth and success as an institution. Charles Cotting died in April of 1903, and on May 1, 1903, the trust established under Susan Cotting’s will transferred 249 Commonwealth to a trust for the benefit of Francis Cotting, the property representing all or part of his inheritance from her. He and his sister, Alice, continued to live at 249 Commonwealth. Francis Cotting died in March of 1914. In his will, he left 249 Commonwealth to his sister, to whom the property was transferred on May 4, 1914. Alice Cotting married in October of 1914 to Edward L. Kent, a banker. After their marriage, they lived at 249 Commonwealth. They also maintained a home in Prides Crossing. Edward Kent died in May of 1929. Alice Kent continued to live at 249 Commonwealth until her death in June of 1947. On September 27, 1947, 249 Commonwealth was acquired from Alice Kent’s estate by Theran Realty, Inc., owned by Louis Theran. 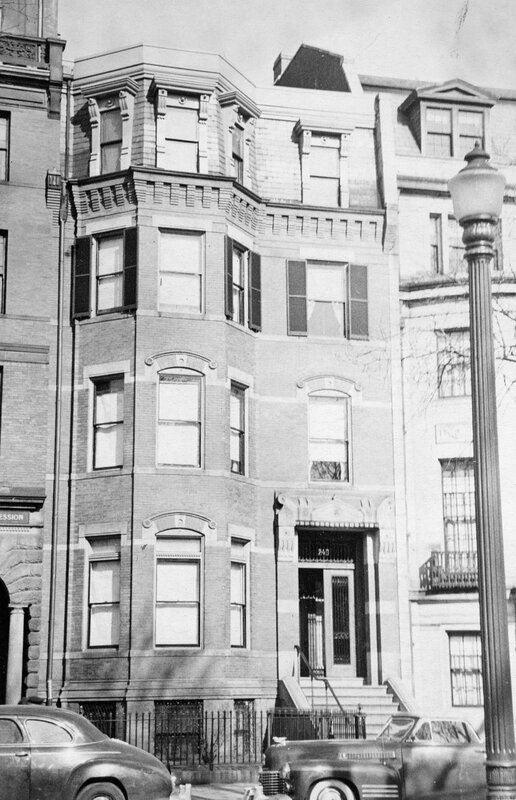 In October of 1947, Louis Theran applied for (and subsequently received) permission to convert the property from a single-family dwelling into ten apartments. On January 7, 1959, 249 Commonwealth was acquired from Theran Realty by John Adam Sulmonetti. He and his wife, Geraldine (Goldsmith) Sulmonetti, lived in Wellesley. On July 28, 1960, 249 Commonwealth was acquired from John Sulmonetti by Harris Wiggin Tucker, a sales manager for the Comptometer Corporation, and his wife, Helen Chase Tucker. They lived in one of the apartments. On December 1, 1961, 249 Commonwealth was acquired from the Tuckers by Morris Perkis. From about 1959, one of the residents at 249 Commonwealth, in apartment 4, was Mrs. Margaret Vernona (Stedman) Chaloff, the former wife of Julius Louis Chaloff. 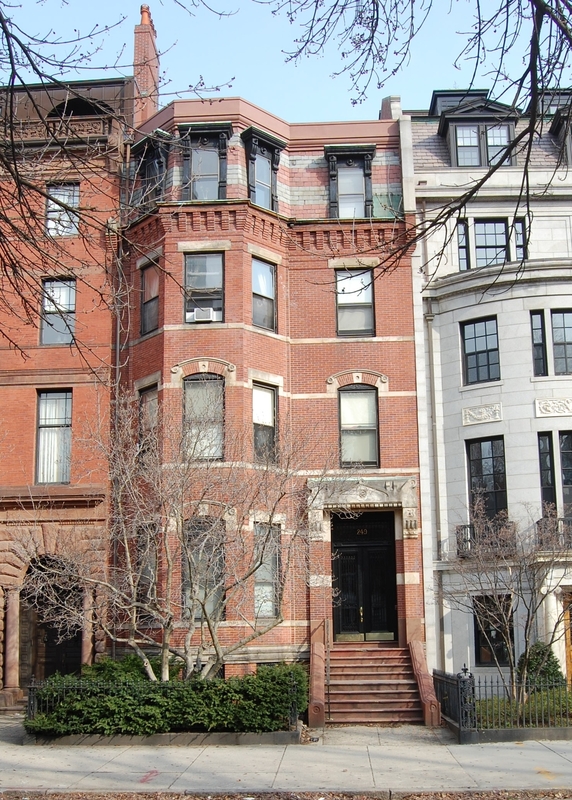 She was a noted piano teacher and also maintained her studio at 249 Commonwealth. She previously had lived, briefly, in an apartment at 334 Beacon with Susan (Black) Chaloff, the widow of her son, Serge Chaloff, a baritone saxophonist who had played with the Woody Herman band. He had died in July of 1957. Before his death, they all had lived at 120 Riverway. During her career, Margaret Chaloff taught at the New England Conservatory of Music, Boston University, Berklee College of Music, and other institutions. About the same time as she moved to 249 Commonwealth she was a teacher at the Boston Music School at 251 Commonwealth. Known as Madame Chaloff, her students included Leonard Bernstein, George Shearing, Herbie Hancock, Ran Blake, and other noted jazz musicians. Her former husband, Julius Chaloff, also was a pianist and operated the Chaloff School of Music at 91 Newbury; he and his second wife, Marjorie Poole (Loring) Chaloff, lived in Newton. Margaret Chaloff continued to live at 249 Commonwealth until her death in April of 1977. 249 Commonwealth changed hands and on January 31, 1969 was acquired by Armen Gechijian. In March of 1975, he filed for (and subsequently received) permission to increase the number of units from ten to eleven. In his application, he stated that had been the number of units when he acquired the building. On February 29, 2012, he transferred the property to Gechijian Realty LLC, of which he was the manager of record. 249 Commonwealth remained an apartment building in 2017.